Papyrus is the material upon which texts of Ancient Egypt, Greece, the Roman Empire, its adjacent countries as well as the earliest sources of the New Testament were written. The start of the cultivation of the plant and usage as writing material is unknown. A hint might be provided by one of the earliest papyrus rolls known, dating back to Egypt approximately 3000 BC. 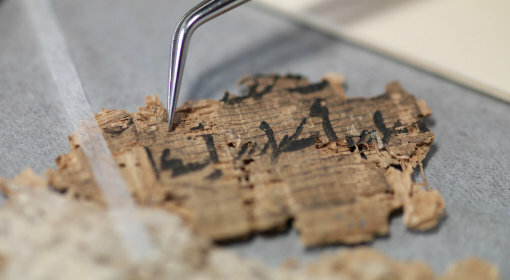 From this time onwards until the invention of paper in China around the 2nd century AD (see “paper”), papyrus was considered a popular means for the preservation and transmission of literature and documentary texts such as e.g. poems, theatrical plays, historic accounts, official documents of the administration, medical recipes, personal notes etc. Texts written on this ancient material therefore provide a direct insight into daily life and thoughts of antiquity. According to current research, there are no primary sources about the exact original manufacture of papyri. The only description is to be found in Pliny the Elder’s (1st century AD) account “Naturalis Historiae” Liber XIII (lines 71 – 86) – an account which is presumably based primarily on his observations and information gained via second hand references. It should also be taken strictly to refer to the original process of production techniques followed in his time. The political and economic situation as well as climate changes in Ancient Egypt, causing the papyrus plant to cease, promoted a slow and gradual decline of the use of papyrus as writing material. Because of the general age of papyrus fragments, the production techniques of the material itself, storage conditions over millennia as well as inappropriate restoration attempts of the past, papyrus provides an exceptional challenge to the conservator. Hardly any other material is as fragile as papyrus or reacts so dramatic to changes of the environment and climate. The aim of the conservation is here to be seen in the stabilisation of the material and the improvement of the readability of texts. To support researchers with the transcription and interpretation of these ancient texts and to preserve the primary support itself, it may be desirable to gently unfold creased objects, rejoin detached separated fragments according to fibre structures etc. as well as to stabilise and consolidate inks and pigments.